The Formula 1 ladies white ceramic, diamond and stainless steel timepiece exemplifies the quality watches Tag Heuer is known for designing. This chic and sturdy watch is fabulous for nearly any occasion. The stainless steel strap and case withstand water and sweat, while the ceramic inlay gives this piece a touch of elegance many watches lack. This watch also boasts a circle of 60 diamonds encompassing the ceramic bezet. The diamonds are small but capture light from many angles and give the watch a gorgeous shimmer. The dial is white as well with silver hour markers and silver hands. The hour markers and hands are luminescent and glow in the dark or underwater so you will be able to read you watch at any place and time. There are four smaller markers between each hour mark on the watch dial, which promote accurate readings to the minute. There are hour, minute and second hands as well as a date aperture at the three o’clock mark. 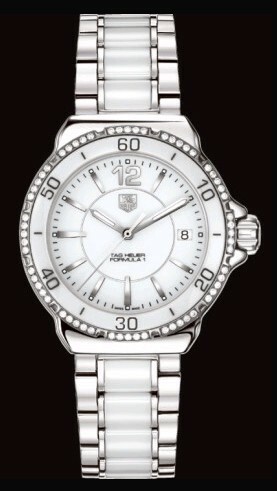 The watch’s face also features the Tag Heuer trademark and reads “Tag Heuer Formula I” beneath the hands. In very small lettering at the bottom of the dial is the Swiss Made logo, ensuring that this watch is primarily manufactured and assembled in Switzerland. Although the Tag Heuer brand originated in Switzerland, the Swiss Made logo assures that this timepiece has undergone strict testing by modern Swiss watchmaking standards. Tag Heuer is well known for their cutting edge watch movements and the immaculate accuracy of their timepieces. This watch runs on a Swiss made quartz movement which is battery powered. Quartz movements contain a quartz crystal which vibrates to maintain consistent accuracy. The crystal vibrates at a frequency of 32,768 times a second and only deviates by a couple seconds per month. The watch is not automatic and the batteries typically need to be replaced every two years. However, it is equipped with an end-of-life indicator (EOL) which notifies you that the batteries need changing when the second hand makes four second jumps every four seconds. The watch face is also made of the finest type of crystal for watches, sapphire crystal. This crystal is scratch resistant and stronger than other leading types of crystal, such as mineral and acrylic. The watch is also water resistant up to 200 meter or 660 feet. Therefore, you can wear your watch while swimming, diving or in the shower without damaging the piece. After splashing or submerging in liquid, it is recommended that you pat it dry with a soft towel. This simple care will assure that your watch has a long life and stays looking like new. This is a truly luxury timepiece from a time-honored brand that will keep you looking glamorous in any setting!